$25,000 price reduction on this stunning used 44' Zeelander yacht for sale! : Atlantic Yacht & Ship, Inc.
John Slate has announced a $25,000 price reduction on this beautiful used 44′ Zeelander yacht he has for sale! In the first place, this used 44′ Zeelander was launched in 2014. Additionally, she is known as “Gazelle” with a stunning red hull. In fact, this particular Zeelander was one of the last boats built at the Tiara factory. Overall, she is in meticulous condition and turn key ready. Furthermore, she has a very rare settee / bed conversion forward! 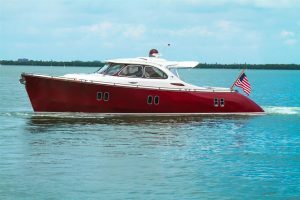 This used 44′ Zeelander is fully-loaded in addition to the Garnet metallic hull. In fact, she is extremely fast quiet, fast, and comfortable. Easy to manuver with her IPS joystick control, docking is a breeze. Furthermore she boasts a dynamic positioning system (DPS) for flawless control and convenience. Always maintained by a professional captain results in condition you will love! This used 44′ Zeelander is truly the best example of a late-model Zeelander available. This is the newest model offered for sale in the United States! For more information on this beautiful used 44′ Zeelander be sure to contact John Slate today!